The White Sea is a southern inlet of the Barents Sea located on the northwest coast of Russia. It is surrounded by Karelia to the west, the Kola Peninsula to the north, and the Kanin Peninsula to the northeast. The whole of the White Sea is under Russian sovereignty and considered to be part of the internal waters of Russia. Administratively, it is divided between Arkhangelsk and Murmansk Oblasts and the Republic of Karelia. The Kola Peninsula is a peninsula in the far northwest of Russia. Constituting the bulk of the territory of Murmansk Oblast, it lies almost completely inside the Arctic Circle and is bordered by the Barents Sea in the north and the White Sea in the east and southeast. The city of Murmansk is the most populous human settlement on the peninsula, with a population of over 300,000 as of the 2010 Census. Arkhangelsk Oblast is a federal subject of Russia. It includes the Arctic archipelagos of Franz Josef Land and Novaya Zemlya, as well as the Solovetsky Islands in the White Sea. Arkhangelsk Oblast also has administrative jurisdiction over Nenets Autonomous Okrug. Including Nenetsia, Arkhangelsk Oblast has an area of 587,400 km2. Its population was 1,227,626 as of the 2010 Census. The Sukhona is a river in the European part of Russia, a tributary of the Northern Dvina River. The course of the Sukhona lies in Ust-Kubinsky, Sokolsky, Mezhdurechensky, Totemsky, Tarnogsky, Nyuksensky, and Velikoustyugsky Districts of Vologda Oblast in Russia. It is 558 kilometres (347 mi) long, and the area of its basin 50,300 square kilometres (19,400 sq mi). The Sukhona joins the Yug near the town of Veliky Ustyug, forming the Northern Dvina, one of the biggest rivers of European Russia. The northern Russian dialects make up one of the main groups of the Russian dialects. 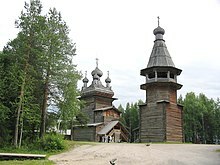 Russian North is an ethnocultural region in the northern part of European Russia. It is known for its traditions of folk art - in particular, wooden architecture, wood and bone carving and painting. Due to its remoteness, the rural parts of Russian North preserve much of the archaic aspects of Russian culture during the 19th and 20th centuries, making it of particular interest to historians, culturologists and ethnographers. 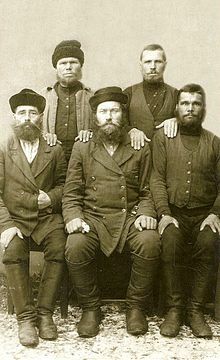 Pomor trade, is the trade carried out between the Pomors of Northwest Russia and the people along the coast of Northern Norway, as far south as Bodø. The trade went on from 1740 until the Russian revolution in 1917. 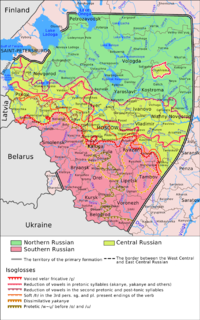 Northern Oblast was an oblast of the Russian Soviet Federative Socialist Republic from 1936 to 1937. Its seat was in the city of Arkhangelsk. The oblast was located in the north of European Russia and its territory is currently divided between Arkhangelsk, Vologda, Kostroma and Kirov oblasts and the Nenets Autonomous Okrug. 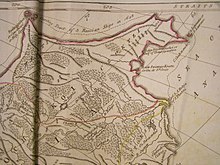 Vologda Viceroyalty was an administrative division of the Russian Empire, which existed in 1780–1796. The seat of the Viceroyalty was located in Vologda. Velikoustyugsky District is an administrative and municipal district (raion), one of the twenty-six in Vologda Oblast, Russia. It is located in the northeast of the oblast and borders with Kotlassky District of Arkhangelsk Oblast in the north, Luzsky District of Kirov Oblast in the east, Podosinovsky District of Kirov Oblast in the southeast, Kichmengsko-Gorodetsky District in the south, Nyuksensky District in the west, and with Ustyansky District of Arkhangelsk Oblast in the northwest. The area of the district is 7,700 square kilometers (3,000 sq mi). Its administrative center is the town of Veliky Ustyug. Population: 18,087 (2010 Census); 22,210 ; 26,146 (1989 Census).